Fall is finally (officially) here! The weather is getting cooler, the days are getting shorter, and the leaves are starting to change colors. The crisp smell of fall is in the air and I could not be happier! As much as I love the warm weather and sunny days, I just love fall fashion! There is something about sweater weather, booties, OTK boots, warm jackets, denim, and comfy sweatshirts that warm my heart and make me feel nostalgic for the autumn season. Fall fashion this year is so good too! 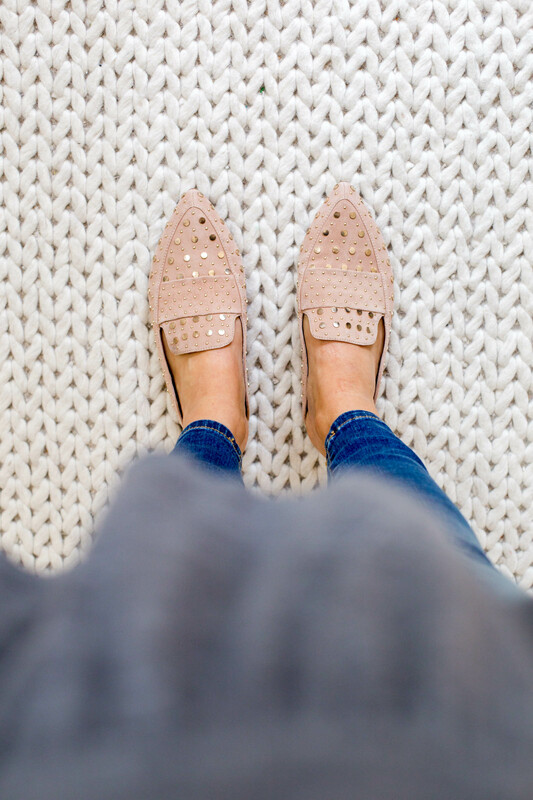 While I’m a minimalist by nature, I am loving the embellished details in these blush mules. They are definitely my “hero” piece this fall! I will be wearing these with jeans (probably maternity) and oversized, slouchy sweaters on repeat. Along with all the chunky knits and cute booties. I love the new fall colors too. I’m seeing tons of burnt orange and dark moody greens inspired by autumnal colors in nature. I rounded up some of my favorite fall pieces right now. Everything from lounge wear to date and work wear pieces. Along with some bags and accessories and shoes as well. If you’re looking to update your fall wardrobe but don’t want to break the bank, invest in a few classic pieces like a new cardigan, chunky sweater, or boots. I am loving this structured sweater blazer and this classic roll neck sweater. Pair with jeans or your favorite leggings. I rounded up some of my favorite fall styles below. Everything is classic yet comfortable. I hope these looks inspire your own fall wardrobe and get you excited for this new season upon us! Happy Shopping and Happy Fall!